Last week I was diving deep into the SharePoint document and records management features of SharePoint 2010 with a colleague (@MikeFortgens). While we were working on setting up sample sites and libraries we ran into some unexpected behavior with regards to site columns. The first thing that we found out that if we added columns from the “Document and Record Management Columns” category to a library we were unable to remove them from that library. Most of the columns are of the type single line of text, which doesn’t necessarily makes sense for all columns. For instance the priority field is a single line of text, but there is also a priority field in the “Core Task and Issue Columns” that is of the choice type. Checking out the names of the columns more closely it became clear that they are remarkably the similar to the options that are available in the content organizer rules. All this leads me to believe that the site columns in this category are all site columns that make up the content organizer rules content types and that they were meant for internal use. A little further investigation confirms this. 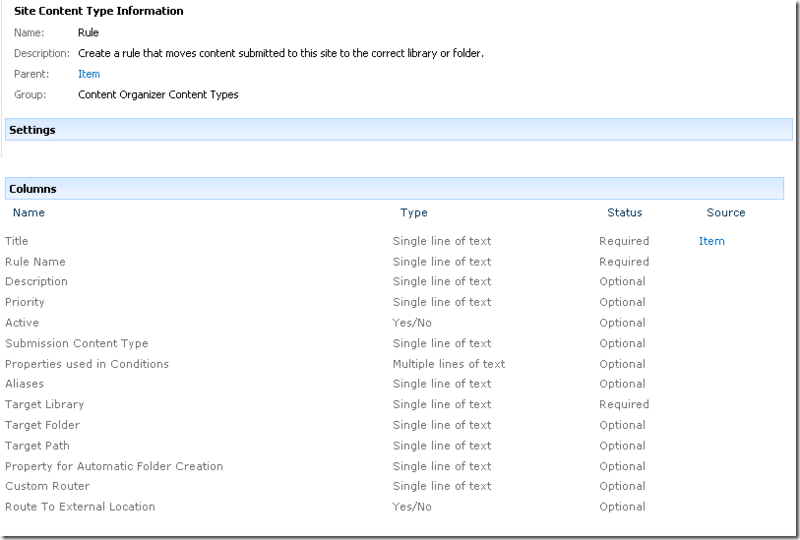 The site columsn from the "Document and Records Management Columns" category are used in the Rule content type in the "Content Organizer Content Types" category. The fields should probably have been hidden from the user interface, or at least placed in a separate "content organizer" category. Using them doesn’t add a whole lot of useful functionality as they are single lines of text. And if you figure that out after adding them to a library you’re in trouble, because you can’t remove them anymore. 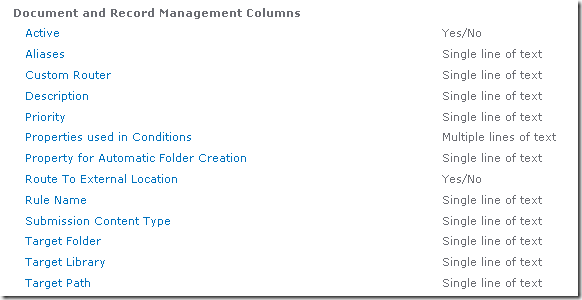 My advice: stay clear of these columns and use other standard SharePoint columns or create your own custom ones.